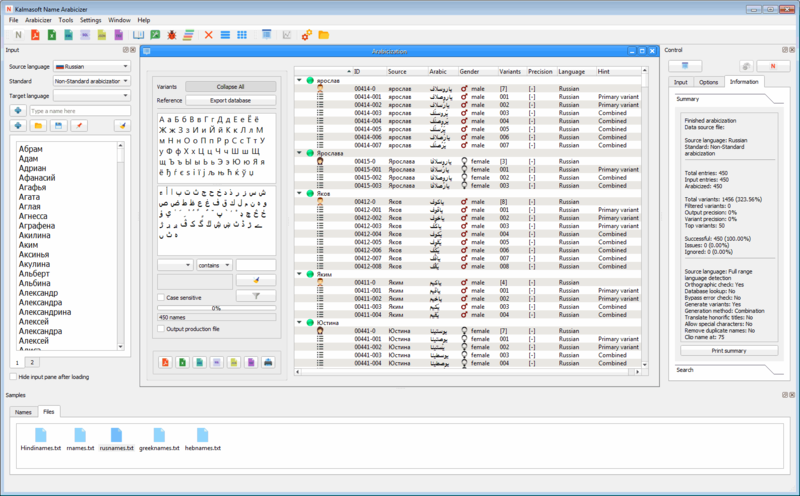 Like Romanizing, the reverse way "Arabicizing" is also possible with Kalmasoft's Name Arabicizing System, a module that produces the vocalized Arabic version of non-Arab names written in any of the European Union's languages as well as many other Semitic and Afro-Semitic languages in their native scripts. The adoption of a foreign name into any language is usually accompanied by a process of adjusting its original pronunciation to suit the phonological regularities in the new language, the name undergoes significant transformation to accommodate the phonological characteristics of the target language. Our system is designed following a strategy that limits such transformation to minimal. The vagueness and inexactness of pronunciation inherent in the source languages is solved with a flexible phonetic based algorithm adaptable to the contrasting cultural naming patterns and styles used around the globe. The system supports more than 50 languages in input: Oromo, Afar, Afrikaans, Amharic, Armenian, Assamese, Bengali, Bulgarian, Burmese, Catalan, Chinese, Czech, Danish, Dutch, Esperanto, Finnish, French, Gaelic, German, Greek, Gujarati, Hebrew, Hindi, Indonesian, Interlingua, Irish, Italian, Japanese, Korean, Kurdish, Malayalam, Marathi, Pashto, Persian, Portuguese, Romanian, Russian, Spanish, Somali, Swahili, Swedish, Telugu, Thai, Tigrinya, Turkish, Ukrainian, Urdu, Yiddish, Yoruba, Tigre, Filipino, Tamazight, Meroitic, Syriac. A screenshot of the MAPSOno interface, you can view the technical specifications. You may also DOWNLOAD Evaluation copy. The sample given below contains multilingual text. Without proper rendering support, you may see question marks, boxes, or other symbols instead of the correct intended characters, you may either get the suitable fonts from our lingual support page or download the PDF version for which no extra arrangement is required.